The city is on the brink of a great battle. A band of Marvel Heroes have come together to face the ultimate challenge as they go head-to-head against the most notorious Villains the world has ever seen. Which side are you on? On this customizable Heroscape playing field, you carry fate in your hand. 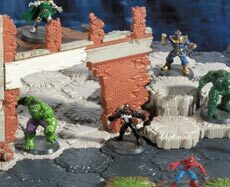 Play one of 8 select Heroscape Marvel games or create your own game! Interlocking hex tiles and a Warehouse Ruin breakable wall section let your imagination run wild. Create treacherous city scapes and danger filled battlegrounds out of 40 separate terrain pieces! Heroscape is the mass market board game with hobby game sensibilities. The master set was a steal when it came out, more so with sale prices that were easy to find. It was a genre bending battle with warriors from all over time and space. It had a thriving online community of hungry fans, eager to see the next sneak peak offered at Gencon, or some other con. Then Hasbro announced Marvel: The Conflict Begins. Compared to the other offerings in the Heroscape family, the Marvel set contains significantly less terrain and figures. It has a small amount of terrain, a warehouse ruin with break away section, and 10 figures. (Spider-man, Captain America, Iron Man, Hulk, Silver Surfer, Venom, Red Skull, Doctor Doom, Abomination, and Thanos for those keeping score at home) In addition, Marvel has much more powerful heroes than in the original. As a result, you throw big handfuls of dice around when your super powered heroes go toe to toe with your opponent. While it is built on the same engine as the original Heroscape, and therefore compatible, the experiences are different. While a comparable army, measured in points, in classic Heroscape is typically more of an army with squads and heroes, Marvel is full of big powerful heroes. The ramped up powers and attack values help to give the game a more epic feel. Unfortunately, Marvel Heroscape didn’t last long. The Marvel set was the only offering to see the light of day. A planned expansion was previewed at conventions, but never made it to stores. The set, while readily available (recently at least), is out of print with no signs of revival. Ironically, I think the game is better than ever today. The terrain can be found here and there, well designed and tested customs (as well as instructions to make buildings for your maps) are freely available at heroscapers.com (look for C3G sub-forums there), and figures from other games provide the minis. Recent games I have played have included some original terrain, toy cars and incidental terrain features, some foam-core buildings, custom army cards, and some Heroclix minis, and they have been some of the most enjoyable Heroscape games I have had since the early days. It was fun when it came out. It stinks that the expansion never saw the light of day. It stinks that the underlying system is a board gaming fossil. I gave it an 8 a while ago, and I think that pretty accurately sums it up for me, as published. Do a little work, and start playing with some of the customs, and it takes me back to Heroscapes golden days. Then it becomes a 10. Like those before me I’ve written a review for the Heroscape main stage, and absolutely love Heroscape. I’ll put that review below this tib about Heroscape Marvel, but there is one important factor that I think is being missed. When we purchased Heroscape Marvel and added to our Heroscape world we were very excited to add this new dimension to the game. However, we quickly realized one important factor. These Marvel characters are very much over powered for their cost verses the rest of the Heroscape world. After one defining game where Silver Surfer fell around our custom made world and almost single handedly took out the opposition we decided we could no longer mix the two worlds with drafting our armies. It was a sad day in Valhalla. Its been about a year or so since I’ve played some Heroscape, but here’s what I remember about this game. 1. If we were all a little honest to ourselves we would admit gaming is a little dorky. We try to act like its not there while we play Ticket to Ride, Settlers of Catan, or some other semi mainstream game, but when you bust out Heroscape you’ve reached dork level 99. 2. This game is awesome and its hard to start with what makes it awesome, but lets give it a swing. a. Components: As I’m sure you’ve read they have very nice components. Each piece is about as top notch as you can get for a plastic piece out of a box. Secondly they are very durable. Sometimes too much so. Taking apart your scape after a few games can prove to be a pain in the behind. 3. Building your own terrain is awesome. The starter box will give you enough terrain for maybe a coffee table, but of course you can add to that and make it as big and wide and tall as you like. Your imagination really is the limit. 4. Time can be a variable with certain games. Maybe you don’t want to dedicate your entire Saturday night to a single game of whatever. Heroscape allows you to create games both with landscape and with your predetermined time in mind. You can draft a army worth 600 pts. or 5,000 pts. depending on how long you want to play. You want to play on long game, Great! Want to play several short games, Knock yourself out! In conclusion, I love and miss this game. I may have to reinvest in it once again and introduce it to a few new friends. Hopefully they are dorky enough to play with me. Add a Review for "Heroscape Marvel: The Conflict Begins"